I guess I've been using our Honey Pie Facebook and Instagram pages instead of this blog to share photos and info for the last couple of years. I decided it would be nice to get back to writing a bit more so lets see what has happened at Honey Pie Hives & Herbals since 2014. 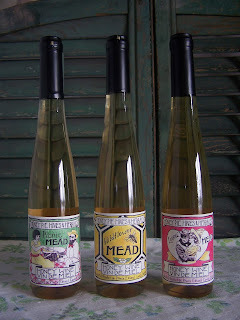 We've added a few more varieties of mead to our selection. Since we already make and sell herbal teas which are popular we decided it would be interesting to use these teas to flavour our mead. 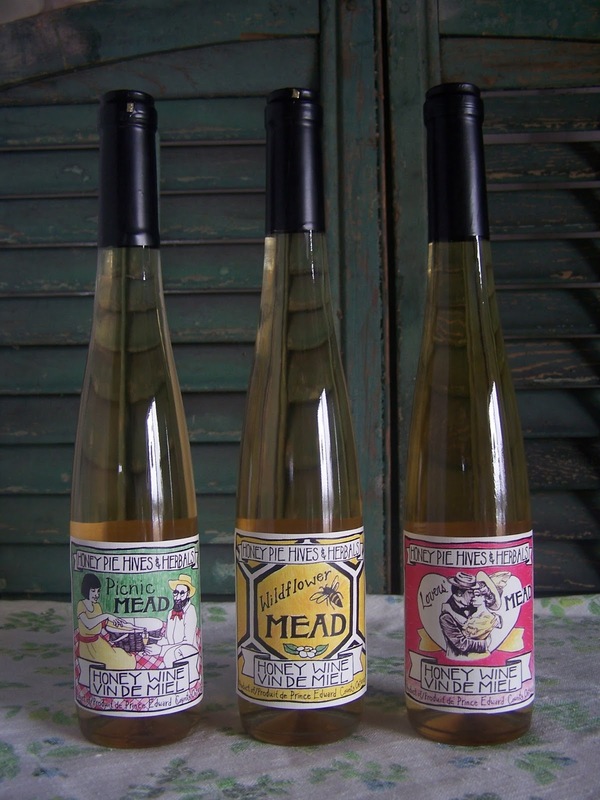 There is a tradition in mead making of adding herbs to the fermentation and the resulting mead is called metheglin. Interestingly, the word comes from the same root as the word amethyst. The word meth means drunken and people used to believe that wearing amethyst could prevent you from getting drunk while drinking. Pictured here on either side of our Wildflower Mead are, on the left Picnic Mead, made from our Tea Party Tea containing wild sumac berries, elderflowers and red clover blossoms and, on the right, Lovers' Mead made from our Lovers' Tea containing ginger, basil, ginseng, saw palmetto berries, damiana and horny goat weed. It's a sweeter mead and very complex in flavour while the Picnic Mead is dryer and has a delicate flavour. Starting last spring in 2015, we built a stone patio outside our farm store. It was a lot of work but I love it so much! 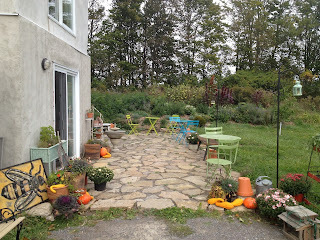 Here it is at the end of the season once the flower bed at the back had grown in nicely. We've got a few tables and chairs set up for customers to relax and taste the mead. We get a lot of cyclists who like to have a place to eat their lunch as well. We didn't serve any prepared food on the patio last summer but this year we plan to offer pie and scones to have with cups of herbal tea. Eventually we'll offer mead by the glass but we're not there yet. This sign has been out on the road at the end of our long lane to help get the idea across. I'm in the process of painting a bigger one for this year. We're on a curve in the road that makes it a bit too easy to drive right past our sign without noticing it. I'm also painting a few signs to put out a bit before our lane to give people more notice that it's coming up. I love the gold paint for the mead chalice - it looks like the holy grail. We took part in Taste - Community Grown in September as well as the Great Canadian Cheese Festival in June last year. 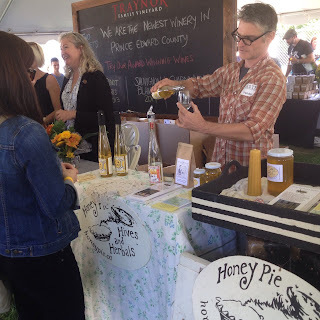 We were so excited to be able to sample our mead at these big food and wine events in the County! This is Gavin pouring mead at Taste. It's great to be able to offer something new for people to sample. 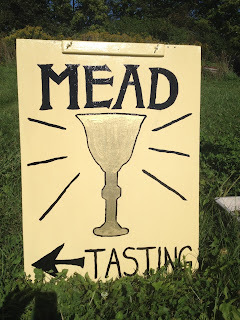 Many people have never tasted mead before so we love to explain how it's made and the history of mead. 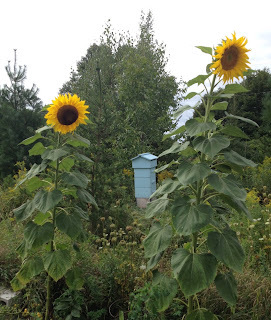 Our sunflowers were giant last summer and the bees loved them as usual. Here are a couple of big ones with our warre hive. As I mentioned before, it's an experiment to see how well the bees do in a top bar hive. So far they've stayed alive for two winters which is great. Since we only have one warre hive it's not a very scientific study. We have 100 langstroth hives which are the industry standard. Over the last three winters we've lost an average of 50% of our hives each year. We've rebuilt our numbers each spring through splitting existing hives and buying new bees. This loss is consistent with provincial average losses and is the reason the Ontario government has decided to phase out a class of pesticides called neonicotinoids for agricultural use. Studies have established a link between these chemicals and the weakening of honey bee health leading to high winter losses. 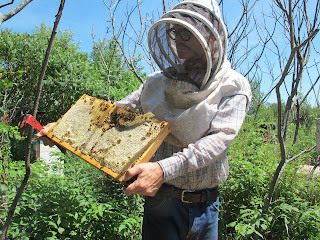 Here is a pic of my honey man working the bees during one of his beekeeping workshops. He isn't wearing gloves here because he's just observing the bees and checking on the queen to see if she's laying eggs. It's possible to work slowly and carefully and avoid squishing bees. It's much easier to be careful when not wearing gloves. Gavin took a selfie at Niagara Falls in August 2015 while at the Eastern Apicultural Society Conference at the University of Guelph. 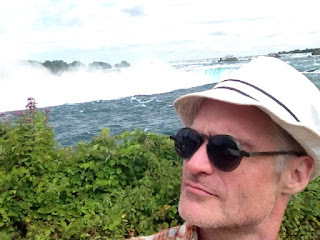 He went on a bus tour to Niagara Falls with a group from the conference. He was invited to give a talk about mead making at the conference which went over very well. 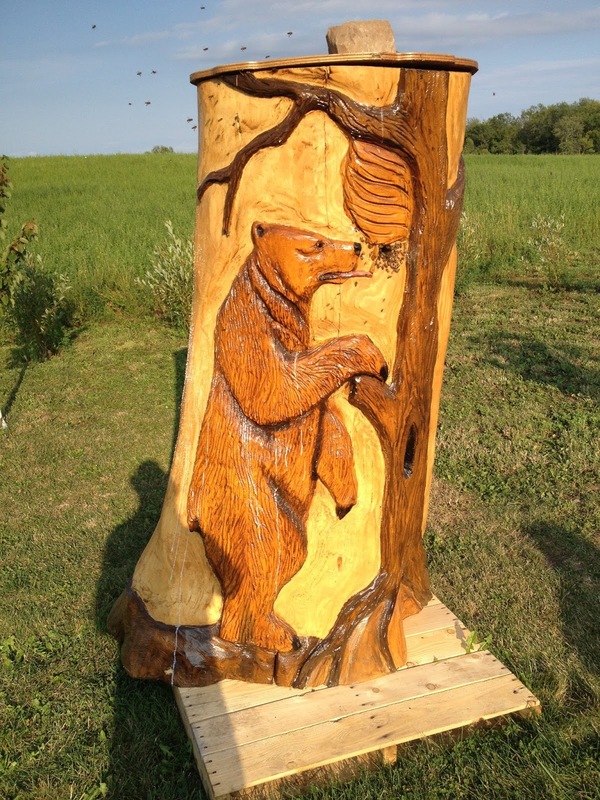 This is a beehive carved from the trunk of a tree. Gavin saw this on a farm tour during the EAS conference. I'd love to have something like this at our place. I have been thinking for awhile now that I want to have more outdoor art along the theme of bees and honey and flowers. If anyone has any ideas they'd like to propose don't hesitate to contact me!